Dr. Holly Wang’s expertise in the world of agricultural economics is sought after on two continents. 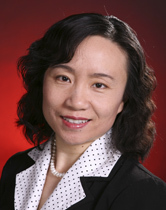 Wang, in addition to her work as a Professor at Purdue University, is a Guest Professor at the Center for Agricultural Development at Zhejiang University in her native country of China. Wang has spent a good part of her scholarly career researching agricultural economic issues in China and has had several papers published on topics in that country, including this year with “Benefit or Damage? The Productivity Effects of the FDI in the Chinese Food Industry” and “The Market Power in the Chinese Wine Industry.” It’s work Wang says she continues to do as China’s large food market adapts with an increased demand in food quality. Wang was part of starting the AAEA China Section in 2009, which at the time was the first section dedicated to a particular country or region. Wang was elected to the Board for a term for 2014 -2017 and served as an Executive Board liaison for the section later. She is also involved in the CWAE Section and served on it as Vice Chair. And Wang is an active participant in the communications strategy. She was recently interviewed by the China Global Television Network on how technology is helping China’s agricultural growth. It was the third time in as many years Wang has been interviewed on that global stage. “The focus of the interview is often the latest Chinese policy,” Wang said, “and the call often comes the day before the live interview. Understanding the broader impact when reaching an audience of millions, a researcher needs to be willing to accept the stress of very short notices and handle the extra demand away from research. If you would like to be part of the Member Profiles, or would like to nominate a colleague, please contact Jay Saunders in the AAEA Business Office (jsaunders@aaea.org).